What is the CONFIDENCE.NORM Function? The CONFIDENCE.NORM Function is categorized under Statistical functionsFunctionsList of the most important Excel functions for financial analysts. This cheat sheet covers 100s of functions that are critical to know as an Excel analyst. It will use the normal distribution, calculate and return the confidence interval for a population mean. The confidence interval is the range that a population parameter is likely to fall into for a given probability. In financial analysisAnalysis of Financial StatementsHow to perform Analysis of Financial Statements. This guide will teach you to perform financial statement analysis of the income statement, balance sheet, and cash flow statement including margins, ratios, growth, liquiditiy, leverage, rates of return and profitability. See examples and step-by-step instruction, the CONFIDENCE.NORM function is useful in predicting and adjusting for a wide range of financial goalsFinancial ModelingFree financial modeling resources and guides to learn the most important concepts at your own pace. These articles will teach you financial modeling best practices with hundreds of examples, templates, guides, articles, and more. Learn what financial modeling is, how to build a model, Excel skills, tips and tricks by optimizing financial decision-making. It is done by applying and graphically mapping financial data into a distribution set of variables. Analysts can make better financial decisions based on the statistical information provided by the normal distribution. For example, they can find the connection between income earnedNet IncomeNet Income is a key line item, not only in the income statement, but in all three core financial statements. While it is arrived at through the income statement, the net profit is also used in both the balance sheet and the cash flow statement. and income expended on luxury items. 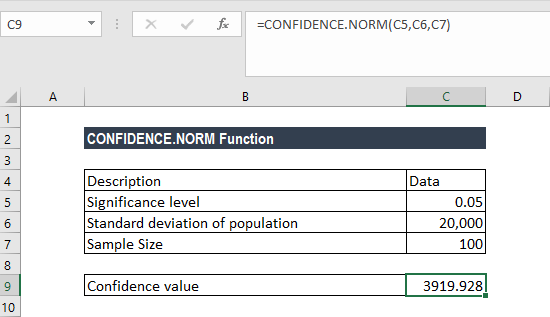 The CONFIDENCE.NORM function was introduced in MS Excel 2010, replacing the CONFIDENCE function, although the latter is still available for compatibility purposes. How to use the Function in Excel? The CONFIDENCE.NORM function is used to calculate the confidence interval with a significance of 0.05 (i.e. a confidence level of 95%). Therefore, the confidence interval is 100,000 ± 3919.928, which is equal to the range 96,080.072 and 103,919.928. The given alpha is less than or equal to zero or is greater than or equal to zero. If the size argument is not an integer, it is truncated. Excel Countif Not BlankCOUNTA FunctionThe COUNTA Function will calculate the number of cells that are not blank within a given set of values. The =counta() function is also commonly referred to as the Excel Countif Not Blank formula. As a financial analyst, the function is useful count cells that are not blank or empty in a given range.